Delacorte Books for Young Readers, 9780385733922, 352pp. The members of the legendary band Lemonade Mouth have been called all of these things. But until now, nobody's known the inside story of how this powerhouse band came to be. How five outcasts in Opoquonsett High School's freshman class found each other, found the music, and went on to change both rock and roll and high school as we know it. Wen, Stella, Charlie, Olivia, and Mo take us back to that fateful detention where a dentist's jingle, a teacher's coughing fit, and a beat-up ukelele gave birth to Rhode Island's most influential band. Told in each of their five voices and compiled by Opoquonsett's "scene queen," freshman Naomi Fishmeier, this anthology is their definitive history. Mark Peter Hughes was born in Liverpool, England, and grew up in Barrington, Rhode Island. Mark's obsession with music has led to many ups and downs. Setbacks include getting ejected from eighth-grade music class for throwing a spitball and the heartbreak of learning that the accordion has no place on a thrash-metal stage. Success came later when Mark fronted an alternative-rock band. He owns a pennywhistle, a broken violin, and a boxful of other musical instruments of mass destruction. Mark now lives and often hums quietly in Massachusetts. 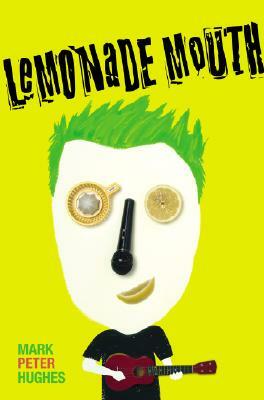 "Lemonade Mouth" is Mark Peter Hughes's second novel. His first, "I am the Wallpaper," was a Children's Book Sense 76 Summer Pick and a New York Public Library Book for the Teen Age.